April 2014 – Damn, I Can Make That! Aloo tiki or potato cutlet is a North Indian snack made of boiled potatoes and various spices. “Aloo” means potato, and the word “tikki” means a small cutlet or croquette. It is found in almost every chaat shop or stall in Delhi, as well as, in other parts of India. It is served hot along with, tamarind and coriander-mint chutney (sauce), known as Hari (green) chutney. I decided I need to learn how to make these after my best friend had a craving for them over the weekend and asked my mom to make us some. They are fairly simple to make and very filling. They are excellent to serve as an afternoon snack with tea or with drinks as an appetizer. Next time we have a craving, we won’t need to run home for them…yum! Boil the peeled potatoes and after they are cooled a bit, using a grater to grate them. You can even use a potato masher instead of grating to save time. Combine all the ingredients in a bowl and mix well. Divide the mixture into equal portions and shape each portion into a round, flat tikki. (Pack them tightly so they don’t fall apart in the pan) Heat a non-stick pan on a medium to high flame and cook each tikki, using oil generously: think shallow fry, till both sides are golden brown. (you will be tempted to mess with them but let each side firm up & get browned, flip gently). Drain on an absorbent paper towel to catch any excess oil and serve hot. This is the Indian version of our latkes. It tastes like nostalgia/home. A little while back a few friends and I went to see the Flamenco Ballet Festival that comes to NYC every year. (If you live in the area and haven’t seen it yet, you MUST get tix next year!) To keep with the Latin theme of the night I booked us reservations at a place nearby called Iguana, “the most spectacular Mexican Restaurant in New York”! Let me tell you, it really is. I was skeptical of the place because it’s in a pretty touristy area. However when we first set foot in the restaurant I was 1. in awe of the size of it (it’s massive for NYC) and 2. the ambiance (hellloooo Spain). We got there before the bar and dinner rush so we had time to soak it all in. We started off with their signature tequilas – if you’re in to margaritas, you’ll feel like you hit the jackpot at this place. They have an entire page in the menu dedicated to margarita flavors, and the back of it is a complete list of their tequilas. Since we were going to the show right after we had to keep ourselves under control (i.e. no tequila flight tastings) but we did each have a delicious margarita – grapefruit, skinny Iguana, and kiwi. True to form, we also started off with their guacamole. 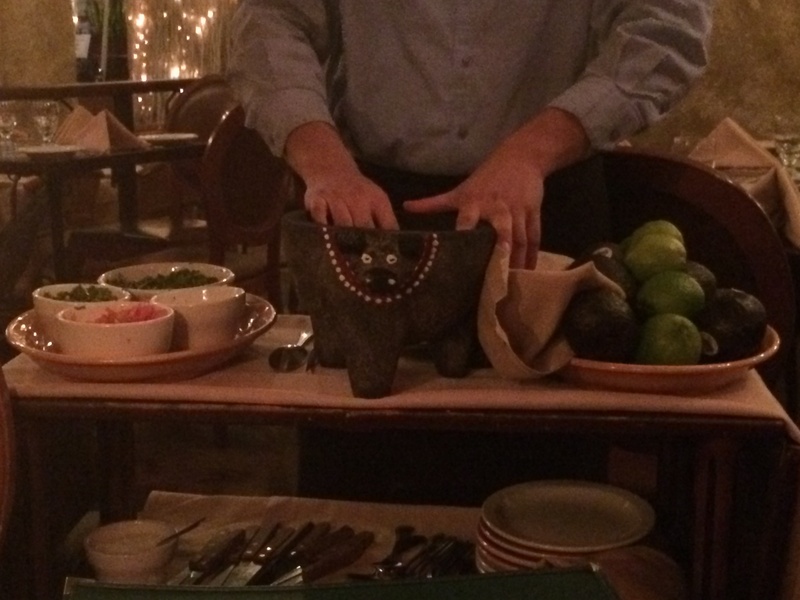 They made it fresh right in front of us, and it was some of the best guac I’ve ever tasted. Unfortunately (or fortunately for my taste buds) we filled up on the stuff. Because after that, we decided to keep to tapas and each ordered small plates to share. I ordered the coconut shrimp that was fried and lightly brushed with honey. The shrimp were massive and felt like a meal in and of themselves. The mix of the sweet and salty was a perfect compliment to my margarita. Next up was the calamari (side note: my husband is so not in to latin food so he played it safe with the calamari, but even he admitted how tasty it all was). Lastly, we ordered something a little more hearty, empanadas, and they were melt in your mouth. Aside from the delicious food and spot on ambiance, the staff was friendly without being overbearing and, yes, even the bathrooms were pretty amazing. (Guys, they had authentic hand painted Spanish sinks. For real!) If you couldn’t tell already, I highly recommend this place. It really is the most spectacular Mexican Restaurant in New York! 1 cucumber thinly sliced in rounds (word on the street is radishes are a great replacement ,but kids find it spicy so I left it as cucumbers, but a thought if you want to do half & half). Mash together the salt, pepper, chives, & butter. Spread a thin later on the bread and place the cucumber slice on top. Smear the other bread before finishing the sandwiches. Serves enough for you, the Easter Bunny, a doll, and Mr. Teddy Bear. (or 4 adults if again, that’s something you are into, hanging with adults or real people for that matter). *same methodology to “construct” as above. Finally, offer an assortment of teas. Not just hot, think iced tea as well! Fruit infused or even good old Arnold Palmers. Lastly, some store bought cookies would be a good way to finish off with something sweet. Enjoy a relaxing Sunday afternoon with your dolls & the Easter bunny or bridesmaids, whatever you see fit. Happy Easter & Happy Eating, XO. Ever since Sonia posted the flies and swims recipe, I’ve had cravings for dill. Weird, I know. I’ve never given dill a second thought (why would I?). But it was so refreshing, I want it in all the recipes! So it got me thinking, how hard could it be to make a dill dressing? I got a little “epicurious” and found a simple recipe for it, but my own spin on it is below. It’s the perfect compliment to our kale and quinoa salad (recipe coming soon!). *Makes about 2 cups of dressing. Whisk the mayo, sour cream, and heavy cream first, then blend in the rest of the ingredients. I stored mine in a cute mason jar so it will last a little longer. And who doesn’t love mason jars these days?! So all my lamenting about it feeling more like fall & winter than Spring finally paid off! This was the first time we had nice weather and it lasted all weekend long! I mean we had to turn on the AC that’s how nice it was! Having said that, its time to eat lighter and more spring like now. So below is my quick and easy salad. I served it with the are you too chicken last night. Yum-o! 1 bag of the Sorrento Salad Mix from Trader Joes (it just has arugula, baby spinach, and lettuce in it. I also throw in a fist full of shredded raddicho just because I had some in the fridge and I like the purple color). 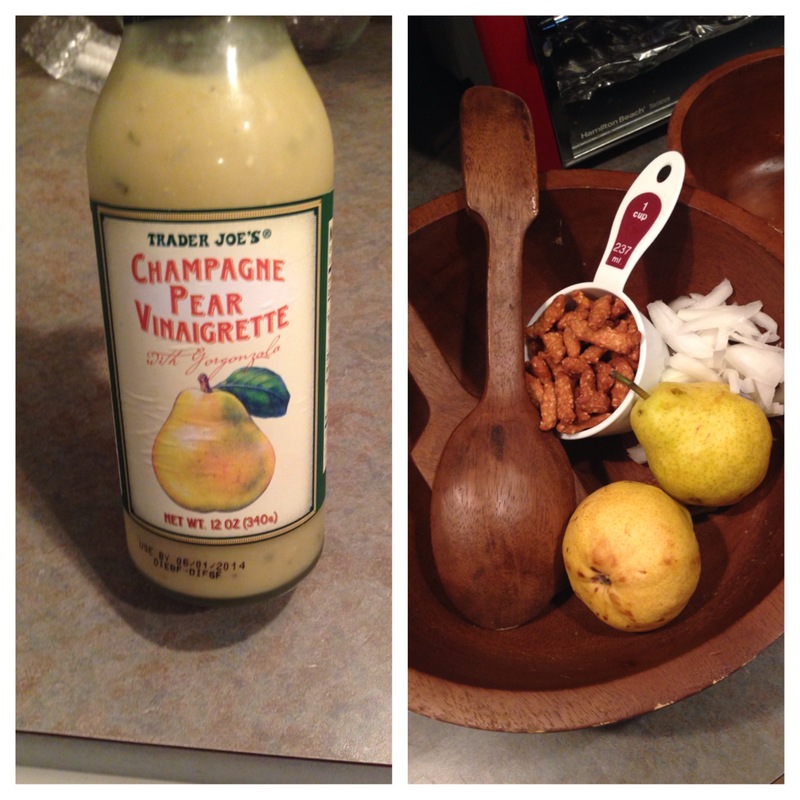 1/4 cup of champagne pear vinaigrette with gorgonzola from Trader Joe’s (I know homemade dressing is better, but I was hung over so I did a short cut, big deal, its yummy nonetheless). Optional is to add some crumbled gorgonzola on the top but I was trying to keep it light so I left out, the vinaigrette is creamy and silky enough you shouldn’t miss the added cheese.